post is to help students with gate syllabus 2013 and notify the changes, if any, given by the GATE 2014 organizing institute. ﻿﻿We will update this post if there are changes declared by the organizing institute. As of now there is no news of any change.If we look into GATE organizing institutes we can easily figure out which institute is going to organize GATE 2014. 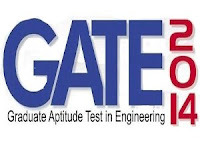 Providing the Past Question Papers for GATE 2014 Exam for all Engineering Branches including Civil Engineering, Mechanical Engineering, CSE/IT Engineering, ECE Engineering, Electrical Engineering, and Many More. These post is publishing on the request of our blog readers who requested for the GATE Past question papers, so here i have collected all past question papers that are available on the internet at various source. These question paper are in PDF file so you can download it and use it for future use. you can use it for self analysis, that we have provided in my Study Plan for the GATE 2014 Examination. These will helpful for those students who are searching for the Question paper with Answer Key for self study.